Adam, Kirby, Debbie and Rhys review the series 11 finale and we also have feedback. Adam, Debbie, Mary and Kirby review the penultimate story of series 11, prior to a hiatus for "new Who". We also have lots of feedback (for a change) and news. Adam and Kirby commentate of this blatant parody of online shopping. We also have feedback and news. Adam, Debbie and Rhys discuss the second historical of the series so far. We also have feedback and news. Adam, Debbie and Kirby review one of the most controversial stories since Curse of the Black Spot. We also have feedback and news. 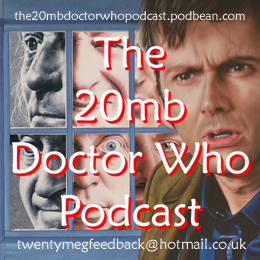 Adam, Izzy, Mary and Debbie review one of the most critically acclaimed episodes of Doctor Who ever. We also have You Won't Get This One, news and feedback. Adam, Debbie, Isabella, Kirby and Rhys review episode 2 of season 11 just after having watched the critically eclaimed Rosa (to be reviewed in Episode #390). We also have You Won't Get This One, Feedback, News and a special series of uncut interviews from Island Con 2018 from Cowes, Isle of Wight with Paul McGann, Sophie Aldred and Sylvester McCoy. Our cosplayer of the year Tia Jackson also makes an appearance as the 13th Doctor. Adam, Izzy, Mary, Debbie and Kirby review the first in a new era of Doctor Who. We also have news, feedback and You Won't Get This One. We also look forward to the forthcoming Island Con 2018 here in Cowes, Isle of Wight on 20th and 21st October. Adam, Debbie, Kirby and Mary review Leela's penultimate story prior to a hiatus for "The Journey" while we enjoy series 11 of Doctor Who. We also have feedback, news and You Won't Get This One. Adam, Mary and Kirby review Louise Jameson's favourite story and we also have feedback, news and You Won't Get This One. Adam, Kirby, Debbie and Mary review this spooky story. We then have feedback, news and an old friend returns on You Won't Get This One. Adam, Debbie and Kirby review the intoductory story for K-9. We also have feedback, news and You Won't Get This One. Adam, Debbie, Kirby and Andy review Leela's last story where she had brown eyes. We also have feedback, news and You Won't Get This One. Adam, Mary, Andy and Kirby discuss Leela's introductory story. We also have feedback, news and You Won't Get This One. Adam, Debbie, Kirby, Mary, Andy and Matthew review the only non-companion story of the classic era. Plus we have feedback, news, You Won't Get This One (trivia edition) and Matthew looks forward to Con Kasterborous 2018 while Adam gushes about the ever growing guest list of Isle of Wight Comic Con 2018. Adam, Andy, Mary, Debbie and Kirby see off Sarah-Jane Smith with a review of another Tom Baker story in our journey through all televisual Doctor Who. We also have feedback (no happy 8th birthday messages), news and You Won't Get This One. Adam, Kirby, Mary and Debbie continue the journey to the renaissance and also have feedback, You Won't Get This One, a little news and a special appearance from Dr Phil. Adam, Mary, Debbie, Andy and Kirby discuss the series finale. A first viewing for a few of us. We also have news, feedback and You Won't Get This One. Adam, Debbie, Mary, Andy and Kirby return to review this classic attempt at horror. We also have news, feedback and You Won't Get This One. Adam, Mary, Andy and Kirby talk about the last story to feature long term character, Benton. We also have news and feedback.